One landlord said in a recent interview that the companion pet issue in particular is one where he just does not know where to go to get the right answers. He said he understands service animals, but when it comes to things like assistance animals, companion pets and emotional support animals, he is confused by the terms. While some landlords and property managers struggle with the pet issue, overall there is a trend nationwide to more and more pet-friendly apartments, and many landlords and property managers say pets are a key to their success. The Humane Society of the United States is also working with the multifamily industry through its Pets Are Welcome initiative to help property owners or managers as well as tenants, since 72 percent of all renters now have pets. “Too many home and apartment owners exclude animals, thinking that the animals are going to damage the properties. That mentality shrinks the pool of living spaces for people and their pets,” Wayne Pacelle, president and CEO of The Humane Society of the United States writes in a blog post. “We have been pet-friendly apartments since the property was built in the late ‘60s. I’ve been managing Twin Ponds for almost 20 years and I have watched the dogs bring the apartment community closer together,” said Deb Palmer, property manager at Twin Ponds in Nashua, New Hampshire. “We have more dogs than children,” she said. Her pet friendly apartment complex has 350 dogs among her 414 units and accepts all breeds, but only two per unit. The residents are closer because they walk the pets in two pet areas in the complex and talk about their pets. She also uses PooPrints, the pet DNA testing service, and that keeps the pet areas clean. “We have pet walkers and behavioral trainers” who work with pets in her apartments, and the pet behavior has been consistently good. “We have had a couple of incidents in 20 years,” she said. She requires tenants to have rental insurance in their lease agreements and agree to the pet-DNA testing requirements, but she does not specifically screen individual pets. Her complex also runs a dog-of-the-month and dog photo contest, where residents send in pictures and vote on the dog of the month with the dog owner’s family winning a prize. Bandit was dog of the month at the pet-friendly apartments Twin Ponds. Buster was another winner at the pet-friendly apartments. They’ve long been referred to as man’s best friend, and now new research from Mintel reveals that no one loves their mutts quite as much as American men. Today, some seven in 10 (71%) younger men aged 18-44 own a dog, compared to just three in five (60%) of their female counterparts. Mintel research on U.S. pet ownership reveals that while the majority (67%) of Americans own a pet, dogs are the nation’s number one furry companion with half (50%) of all Americans owning a dog. This rises to 52% of all U.S. men, compared to 49% of women. Older Millennials in particular make up a large portion of the nation’s dog lovers, as three quarters (75%) of consumers aged 30-39 own a dog. “While pet ownership over the last few years has remained near half of all Americans, our research indicates that dog ownership is elevated among younger men. As pets are seen more and more as companions and family members, Americans are taking additional steps to ensure their health and happiness, and are spending more in the process,” Rebecca Cullen, Associate Analyst, Health, Household, Beauty & Personal Care at Mintel, said in a release. The findings come at a time when Millennials, roughly defined as the generation born between 1980 and 2000, are half as likely to be married or living with a partner than the adults of 50 years ago. They are also delaying parenthood and demanding flexible work arrangements — all of which, researchers say, has translated to higher rates of pet ownership.And pet friendly apartments are something Millennials seek. “It is our belief that there are not bad dogs, there are bad dog owners,” said Cliff Orloff, owner of Orloff Property Management, which owns approximately 800 units in Sacramento and Berkeley, California, and Indianapolis, Indiana. A lot of properties do not want the hassle of pets, he said. Or it’s a property management company and it’s not their own property. He said well-managed and well-maintained properties enforce the rules and do it right. And it is a lot of work, and some property management companies do not want to do that. “NPR4dogs was started in 2016 by Cliff Orloff, an owner of more than 800 multi-family units, in response to dog-poop issues at his properties. “One of those properties, Riverfront Apartments in Sacramento, California, had a big problem. It accepted dogs without weight or breed restrictions (although a dog interview was required to avoid renting to anti-social dogs). It also allowed multiple dogs in a unit. As a result, it had almost as many dogs as apartments, and despite having dedicated dog runs, written rules requiring residents to pick up their dog poop and doggy areas stocked with plastic bags, the dog poop problem became unbearable. Responsible dog owners complained about stepping into dog poop every time they took their dog for a walk. The poop smell became very unpleasant. What to do? “Researching possible solutions took Cliff to the website of the Veterinary School at University of California at Davis. The Veterinary School developed a state-of- the-art program to DNA-sample dogs at a reasonable cost and to DNA-match dog poop to dogs. Using this DNA technology, Riverfront set up a mandatory registration for dog DNA screening, data management and resident incentive systems to organize this effort efficiently. “The result was dramatic. The dog poop problem went away overnight. Responsible dog owners who lived on the property hailed the new program. Most of the irresponsible dog owners changed their behavior and became responsible dog owners. “To see if this result was unique to Riverfront Apartments, NPR4dogs was implemented at a 324-unit apartment complex in Indianapolis called Broad Ripple Trails. Again, the result was dramatic. The dog- poop problem went away almost overnight. In terms of managing pet poop in pet-friendly apartments, he said, it is a behavioral thing, like speeding down the highway. “If you see a police car in the road, you slow down to 70. It’s a behavioral thing. There are some dog owners who just as a matter of fact they pick up after their dogs. There are some dog owners who do pick up after their dogs if they have to, because if they don’t they are going to get fined. Then there are some that don’t. And the ones that don’t, they leave. If we can get this rolling on a large-scale basis it is like a credit bureau for dog owners. These are the responsible dog owners who can say if they move to another property I got an A1 rating from my previous two apartment complexes. “We own enough property ourselves we can see if it works and it works because it is a behavioral thing. “I like dogs. My wife is a cat person. It is all about the people,” Orloff said. The concept of pet-friendly apartments and a welcoming pet policy by landlords helps deal with reasonable accommodation requests. Matthew Wildman, pet retention manager for The Humane Society of the United States said, “There is so much misinformation out there. Our position is allowing pets in rental housing is good for business. Hundreds of properties allow dogs and cats without restrictions on breed.” He said the number one reason animals are sent to shelters is because of rental situations where they cannot keep a pet. Wildman said there is confusion over terminology and so he put together answers to 7 of the top questions owners, landlords and property managers have about this issue. A question and answer on pets and pet-friendly apartments with the Humane Society of the U.S.
No. 1- Question: I am confused over the terminology of service animal, assistance animal and companion animal. Tenants use different terms such as these to refer to their pets. How do I as a landlord know which is which? Answer: Federal fair housing laws state that to request a reasonable accommodation, the tenant needs to submit reliable documentation of a disability and the need for an assistance animal. This usually comes in the form of a letter from a doctor or health professional verifying that the tenant has a disability and identifying how the animal assists the person with this disability to enable him to full use and enjoyment of the dwelling. As per federal fair housing laws, if this information is provided the housing provider is required to grant the reasonable accommodation request as long as accommodating the animal does not create an undue financial hardship for the landlord (this is rarely the case) or the specific animal poses a verified nuisance or danger to the health and safety of others. According to the Centers for Disease Control and Prevention, one out of every five adults lives with a disability. Unless you’re receiving requests for an assistance animal from over 20% of your residents, it’s unlikely you’ll encounter a fraudulent claim. While the verification document may be suspect, the tenant can still have a valid disability and appropriate need for an assistance animal. The accommodation request is intended to be an interactive process between the tenant and housing provider. You don’t have to be afraid to come back to the tenant and let him know that you’re concerned about an aspect of the request and ask the tenant for additional information. It may be helpful to temporarily grant the request until a final determination is made to avoid a claim of undue delay. 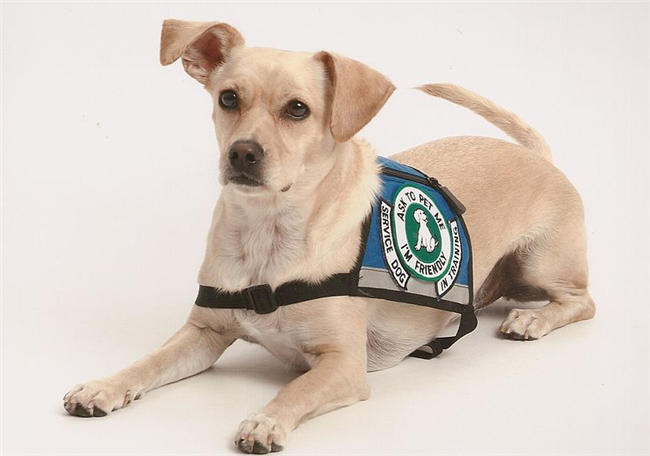 An emotional support animal is a type of assistance animal, one who is not trained and who provides emotional support to their owner who suffers from a disability. There are for-profit companies that provide tags and vests stating an animal is a service animal, but these are not government-sanctioned companies, and they create a tremendous amount of confusion for both residents and housing providers alike. If the housing provider does not believe that the tenant has adequately demonstrated that he or she has a disability or that he has a need for an assistance animal or the request is unreasonable, they have the right to deny the request, but this carries the risk of opening themselves up to a discrimination lawsuit. No. 3 – Question: Under Fair Housing rules do I have to rent to someone who says they have an assistance animal and they have a note? Answer: Housing providers have the right to screen disabled applicants as they would any other applicant. However, if the applicant requests a reasonable accommodation for an assistance animal and provides sufficient documentation of the disability and the need for the assistance animal, denying the reasonable accommodation would likely violate fair housing laws unless the request imposed an undue burden. Denying an applicant because of his assistance or service animal is akin to denying an applicant housing because of a wheelchair. No. 4 – Question: What about service animals? Do I have to rent to anyone anytime they have a service animal under Fair Housing rules? Answer: Service animals are a type of assistance animal. If the applicant provides reliable documentation of having a disability and needing a service animal and the animal does not pose a direct threat to the health and safety of others, denying an application because of the applicant’s assistance or service animal would likely violate discrimination protections. No. 5 – Question: Can I legally refuse certain types of large breed dogs or dangerous breed dogs if the tenant says it is an assistance animal? Answer: Assuming the tenant provides reliable documentation entitling him to the use of a service or assistance animal, The Department of Justice has determined that pet restrictions may not be applied to service or assistance animals. This means that number limits, breed bans or size restrictions may not be applied, and the housing provider may not impose a pet deposit or fee, but the owner is responsible for any damage the assistance animal causes. The Humane Society of the United States encourages property owners and managers to welcome pets and remove arbitrary and unnecessary breed and size restrictions. This among other benefits, will reduce the number of requests for service and assistance animals. Conversations we’ve had with property owners indicate a strong correlation between assistance animal claims and pet policies. In short, the more welcoming of pets you are, the fewer the requests for reasonable accommodation you’ll receive. No. 6 – Question: How can I verify that just because a potential tenant has a tag that says the pet is an assistance animal that that tag is legitimate and not a forgery of some type? Answer: There is no state or federal certification required for assistance or service animals. The only documentation needed is from a reliable health care professional. Complicating matters is the fact that private for-profit companies have sought to fill this vacuum by providing individuals (for a fee) with official-looking tags, vests and documentation that seemingly verify an animal as an assistance or service animal. What’s important to note is that use of these companies does not indicate that the resident is attempting to “fake” their status as someone living with a disability or the animal’s status as an assistance or service animal. These companies use official-sounding names and most of their customers are as in the dark as housing providers that these companies are not officially sanctioned. If a tenant submits documentation from one of these online service providers, you are entitled to engage in the interactive process and ask the tenant for additional information that’s more reliable. No. 7 – Question: Can I screen a potential pet the same way I screen a potential tenant? Is that legal and how do I do that? Answer: Housing providers have a right to ensure that pets as well as assistance and service animals do not pose a direct threat to the health and safety of others. The HSUS has guidelines on how to conduct a “meet and greet” for pets, assistance, or service animals. Contact us at petsarewelcome@humanesociety.org for information. Conclusion: Pet-friendly apartments and pet issues are only going to become larger for the rental housing industry going forward as the pet population and the rental population both continue to grow. Many apartment rules were adopted in the 1990s, when there were far fewer pets and pet-friendly apartments. Rules often have not been updated as the Millennial generation is moving into rentals with more and more pets, and often with larger and more diverse breeds. These seven questions and answers should help owners, landlords and property managers, as well as tenants, going forward with issues around pet-friendly apartments.